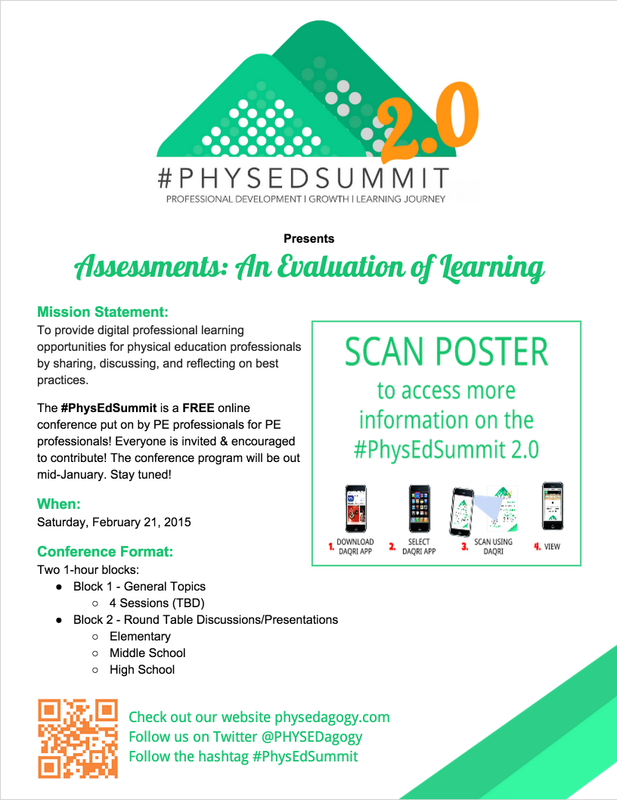 We would like to share a poster we created to help promote and provide more information on the #PhysEdSummit 2.0. Please download and share with any teacher, administrator, district/division and associations you feel may benefit from this type of conference. As we get closer to February 21st more information will be shared! Click on the link below to access the poster. A few features have been linked into the this poster with Augmented Reality and a QR Code to add in more information. Use the DAQRI app (iOS or Android) to scan the poster for links to all the latest information. Scan the QR Code (with i-nigma) to access a folder with #PhysEdSummit 2.0 resources. Our next step will be sending out the “call for proposals”, please stay tuned for this post early next week! Let us know if you have any questions about the #PhysEdSummit 2.0 in the comments below!